Beautiful Tufted bench cushions, Soil and Stain Resistant in a lovely soft textured polyester ribbed fabric. When measuring your bench for a cushion be sure to include any bevel on the edge of the bench. Select from the Fabric Colors shown below. Each cushion is tufted with piped edges and a 1" thick padding. Available in standard sizes or Custom-Made up to 90 inches wide. Sewn in tie-down strings made of the same fabric to attach your cushion to the underside top of your bench so they stay secure. Each cushion is completely reversible. Beautiful acrylic Polyester Velour fabric: Click here to see larger color photos. 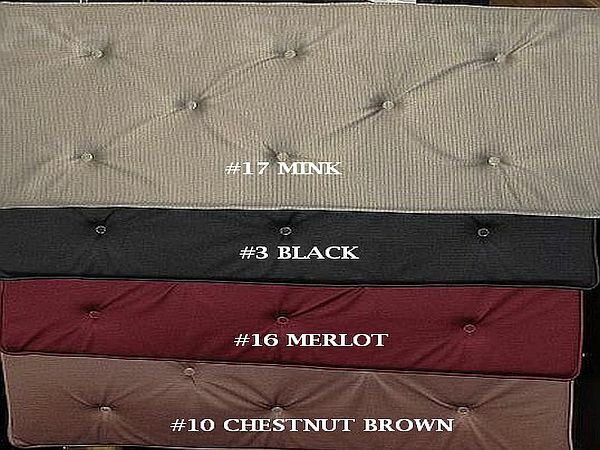 CUSTOM MADE CUSHIONS:....If you don't see your size listed below, we can custom make your cushion to fit your bench. Select "Custom Made" as your Item number in the drop down list below, and type in your bench measurements in the appropriate box. IMPORTANT: - Custom Made Sizes ..... 19¢ per square inch. (Please note that our shop cannot calculate the price of a custom sized cushion. You can get your price by multiplying the width x length then multiply by 19¢.) For example: 13" x 39" = 507 sq. in. x 19¢ = $96.33. If Custom: Enter Size & Price @ 19¢ per sq.in. 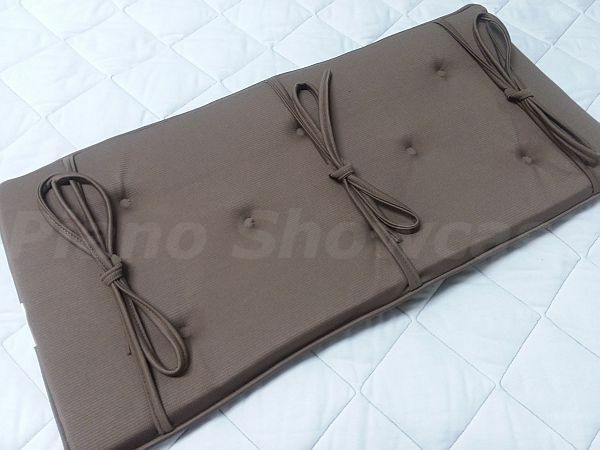 I purchased a piano bench cushion for my Granddaughter, this past Christmas. She was surprised and delighted! The quality and craftsmanship are excellent. I received it on time and in great shape. This cushion will be used everyday and I am confident that it will wear well along with being comfortable. The fact that itâ€™s soil and stain resistant is a real bonus, as well as being made in the USA! I needed a replacement for my tired and worn piano bench cushion. I ordered one, after very helpful advice from your staff. It is just exactly as pictured on your website. The workmanship is excellent and it fits well, secured by 3 ties which fit between the music storage part of my bench, and the hinged top. I will try to review this product without gushing, but quite frankly, it is beautiful! It fits perfectly. The color is exactly as pictured. The workmanship is very impressive. It is worth every dime. I got everything I asked for and more. Great, great value. Thank you. You have a customer for life. I love my new piano bench cushion. It shows no markings from sitting and the color is another perfect accent color that compliments my furnishings beautifully. The person from your company was really extremely helpful and friendly in assisting me in my purchase. The bench cushion was exactly as portrayed in the picture and description. 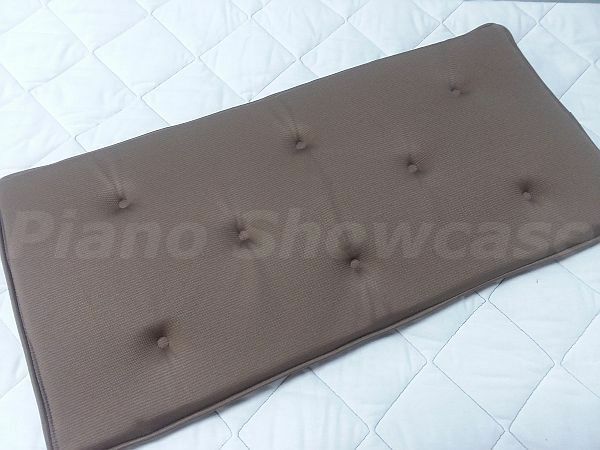 I am very pleased with the product and would recommend without any reservations to others looking for a high quality very comfortable piano bench cushion at a very reasonable cost.